The year is 1840 and America's first mining boom is about to change the remote wilderness of Michigan's Upper Peninsula forever. Take on the role of a mining company and compete for copper by casting your miners and machines into the underground lottery. As the industry grows, so do the communities surrounding your mines. But every attempt to wrest copper from the ground hangs the fortunes of your company, and the lives of your miners, in the balance. 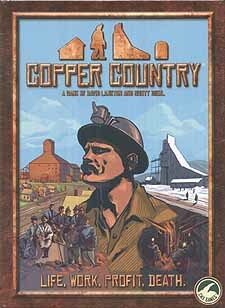 Life, Work, Profit, Death: Copper Country.